Time to brush up on your periodic table? 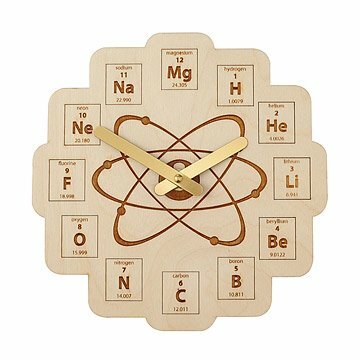 This wooden wall clock features the first 12 elements--hydrogen through magnesium--arranged by their atomic number and corresponding to each hour. Perfect for students, scientists, and chemistry geeks, this compact clock will help keep track of the time in the lab, in the classroom, or at home. Handmade by Matt McCoy in Texas. When Matt McCoy opened his shop in Texas he was searching for a way to parlay a life-long habit of woodworking into a business that would allow him to channel his creativity. Little did he know that the real rush would come from the high fives and encouragement he receives from the good folks who take his pieces home. While working in his shop, Matt enjoys listening to jazz records and savoring the smell of freshly-cut hardwoods. His design approach is simple: make cool art that is practical and can be useful in someone's life. He appreciates genuine and authentic items with a hint of vintage nostalgia. I bought this for my husband for Father's Day and he loved it! He likes unique clocks and The Big Bang Theory so this was perfect. Looking for a gift for a chemist who is getting a promotion and his own office. This clock shows the first twelve elements of the periodic table, coordinated with the hours.